Six of One attempt to put a stop to Fan events and websites. "At the end of last year a cinema club in London called The McGuffins decided to hold a Prisoner evening. They planned to invite a few guests and to screen two episodes in their cinema.................When they (Six of One) were first informed about the event by a London member, their reaction was to issue a curt reply stating that the McGuffins did not have the right to screen the Prisoner and so Six Of One could not advertise the event anywhere............ their next move was even more shocking. Unbelievably, they contacted Carlton to warn them that an illegal Prisoner screening was about to take place in London. Two weeks before the planned screening, the McGuffins received a legal letter from Carlton warning them that the screening must not go ahead. Unbeknownst to Six Of One however, the McGuffins had indeed arranged for the proper licences to be purchased, but this was done through an independent company which had permission from Carlton to issue screening licences. Carlton were politely informed of this and they issued an apology to the McGuffins". No member of the coordination team has ever apologised for this attempted stoppage of a fully-sanctioned event. This event is now available to purchase on DVD. Visit The Unmutual website for more details. In late 2005, Six of One even claimed that they had given full publicity of this event when they attacked a charity fundraiser - click HERE for more on this. In October 2005, realising that they had no power to halt events sanctioned by the series' copyright holders, Six of One have employed a new tactic of attacking events raising money for terminally-ill children! Click HERE for more on this. They have also tried the same thing with Prisoner-related websites. In August 2001, website and fanzine creator Geoff Lake told a packed bar of fellow Prisoner fans in Portmeirion that Roger Langley had been compiling a list of Prisoner sites (including Lake's). Assuming it was for promotion within the Society magazine, Lake gave Langley the details. What Langley did then, however, was to contact Carlton International (the copyright holders for the series) and ask that these sites be shutdown, arrogantly believing that only Six of One were the only "official" body and that only they had the right to promote the series. Carlton, of course, were happy for these sites to continue promoting their product and told Langley to put a halt to this escapade. "I hate that f***er. He tried to get Carlton to shut down my website". Amazingly, just a few months later, Geoff decided to ditch this belief, accepting a personal invitation from Langley to join the disgraced coordination team of the Society. Lake seemed to have forgotten any principles he might have previously had, even removing a link between the "Free For All" website and the excellent "The Penny Farthing" website (a fanzine he used to co-edit, left) run by a group of people he used to regard as friends. He has also removed a link within his own site in which he gives a bad review to one of Langley's books, obviously not wanting to cause upset to his "new boss". This page is still on the web, however, read it HERE. Beale had also stated that he had asked Portmeirion to change the settings on their PC so that the favourites folder can not be altered again. We wonder what Carlton would make of this, being that Six of One refuse to promote the Carlton Official Merchandise which is sold elsewhere. 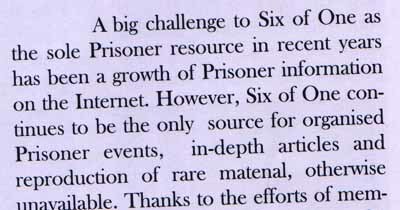 "I also know of an instance where Six of One was attempting to interfere even with other organisations wanting to put on Prisoner-related events. This was an event being organised during the nineties by Mary Milton, now a professional sound recordist working in TV, at that time freelancing for an organisation providing education and training in the media. John Legeu, set dresser on the series, had been invited to speak about the production process on the series. Mary told me she was having a lot of trouble because 'some-one' in Six of One was complaining to the copyright holders about the fact the event was being put on - as if only Six of One should be able to host Prisoner events.Yet this was a free, non-commercial event for the purposes of education, which Six of One members would have been equally welcome to attend. The outcome was that the copyright holders told Mary to just quietly go ahead, and not tell Six of One! I was very surprised to hear that the copyright holders were having to use this kind of subterfuge, when all members have always been lead to believe it's the society who has to comply with the copyright holders, not the other way round." Merlina Waterworth, January 2013. Langley has also written people out of the Society history, and has proved very difficult to work with. He remains at the helm of Six of One as of February 2016 and still holds the views above.